A growing movement in the United States seeks to loosen regulations on having guns on school grounds and college campuses. A bill that would have eliminated the state’s gun-free zone law failed in the most recent legislative session. Currently, campuses in Wisconsin such as the University of Wisconsin-Madison, above, must allow concealed carry permit holders to possess firearms except in buildings where entrances are posted with signs specifically prohibiting them. A growing movement in the United States seeks to loosen regulations on having guns on school grounds and college campuses. A proposal in Wisconsin to allow more concealed carry license holders to do that died in the most recent legislative session. Currently, Wisconsin and 11 other states require public colleges and universities to allow concealed carry of guns, with some restrictions. 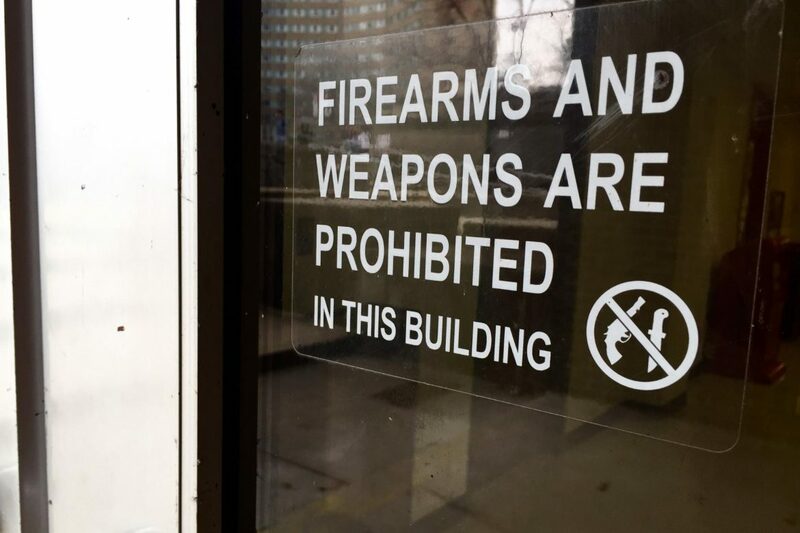 Colleges and universities in Wisconsin can ban the possession of firearms inside buildings only if they post signs at the entrances explicitly prohibiting them. Authored by state Rep. Mary Felzkowski, R-Irma, and Sen. David Craig, R-Town of Vernon, the “constitutional carry” measure introduced in 2017 originally sought to eliminate the state gun-free school zone law, while still allowing schools to prohibit guns in posted areas under state trespassing laws. The amended version of the bill, which died at the end of the legislative session, also would have revoked schools’ ability to ban people from possessing weapons in or near their vehicles on school grounds, provided they had a concealed carry license. In addition, the bill would have allowed concealed carry license holders to bring guns on school grounds when no school activities are taking place. Recently, The Observatory fact-checked a claim by Assembly Majority Leader Jim Steineke, R-Kaukauna, that most school shooters passed background checks. We found his claim Mostly true. In 2015, a proposal authored by state Rep. Jesse Kremer, R-Kewaskum, and Sen. Devin LeMahieu, R-Oostburg, would have banned colleges, universities and technical colleges from prohibiting concealed carry license holders from bringing their weapons on to campus. It died in 2016. Among the states that require campuses to allow concealed carry are Arkansas, Colorado, Georgia, Idaho, Kansas, Mississippi, New Hampshire, Oregon, Tennessee, Texas, Utah, Virginia and Wisconsin, according to the Giffords Law Center To Prevent Gun Violence. The center is named after former U.S. Rep. Gabrielle Giffords, who was seriously injured after a gunman shot her and 18 others during a public appearance in Tucson, Arizona in 2011. Six people died. Each of these states’ laws has some unique regulations. Some allow the institutions to determine who can carry weapons or where they are allowed on campus. The most recent bill would have allowed people who violated posted signs against carrying firearms on K-12 school campuses to be charged with trespassing, punishable as either a misdemeanor, if the trespassing occurred in a building, or a fine, if it occurred on posted school grounds. Marc Lovicott, the UW-Madison Police Department’s communications director, told The Observatory that the department’s position has not changed since then. “We do not support it,” Lovicott said. Among those voicing opposition was UW–Stevens Point Chancellor Bernie Patterson, a former police officer, military intelligence special agent and criminal justice professor who holds a Ph.D. in criminology. UW-Stevens Point does not allow guns on campus but does provide an armory for students who live in residence halls to store their hunting rifles.